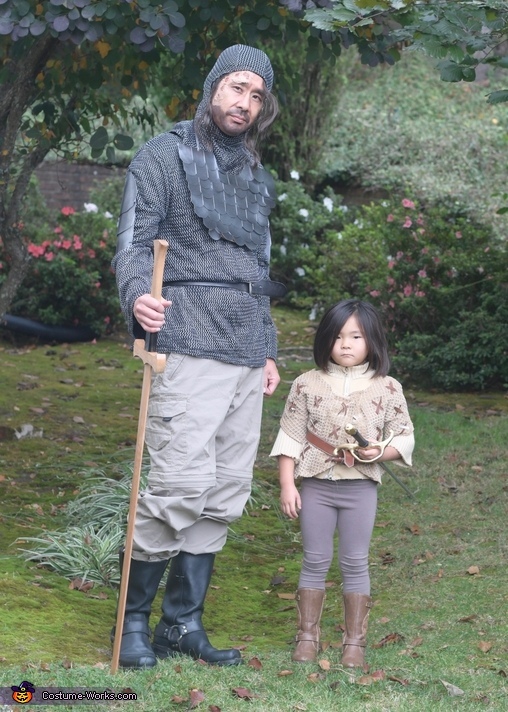 My 5 yr old daughter, Scarlett's haircut inspired me to transform her into Arya Stark one of our favorite characters. Who better to go with her than The Hound (her dad). I found a kids size 10 sweater at the 2nd hand store and cut it down to size 5 and made her a vest out of upholstery fabric. He sword needle is a wooden dowel sharpened on one end and the handle is polymer clay and details are made from leather and a rubber eraser. I used wig hair woven into a wig cap to give the illusion of the sparseness of The Hound's hair and used rubber latex to replicate the grotesque burn. The armor is made from cardboard and silver greeting cards cut to resemble metal plates. THis costume is the best!